This series, first made in 1891, consists of eleven steins depicting books for various professions (“profession steins”) and one special order stein for Cornell University. 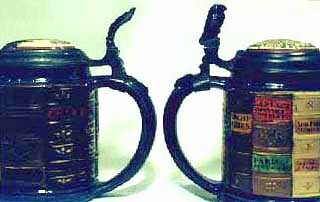 Each of the twelve steins exists in 1/2-liter content only. 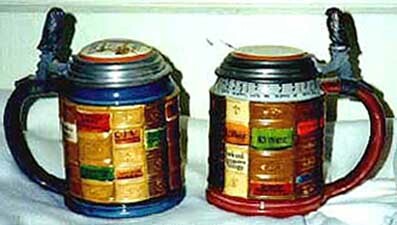 The profession steins are listed in the Mettlach catalogue under form #2001 with the respective letter as “Bücherrücken für ...” (book backs or spines for ...) followed by the corresponding profession. The catalogue uses small letters to distinguish professions as opposed to the capital letters actually used on the stein bases. 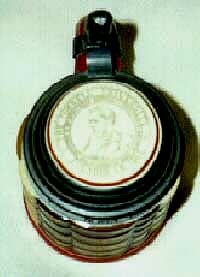 As noted in Dr. Therese Thomas’ article in the September, 1994 issue of Prosit, these steins are credited to Otto Hupp because sketches of six of the incised lids found on these steins have been located in his personal effects. The body of the book steins is made of grey stoneware. The usual body measures approximately 4-1/2" in height, 3-15/16" in diameter at the top and 4-1/8" at the base. The base is essentially flat, not the typical raised false bottom that is common on 1/2-liter Mettlach steins. Fig. 1 – Upside-down “Newton”. The base band is slightly flared, whereas the top band is contracted. The main portion of the body of each stein depicts, in full color relief, leather spines of eleven books. There are bands at the base and top of the stein body, which are located immediately above and below the leather spines. On the profession steins these bands are blue. The blue coloring is created by the application of a blue glaze over the grey stoneware. The same color glaze was applied to the handle. The blue varies from medium to dark blue due to the color of the glaze applied to a particular stein. The spine of each book on these steins is individually titled and divided into 4, 5 or 6 sections. Each of the book spines on a stein is individually colored to assist in appearing as though there are eleven different books on the stein. The coloration of the spine on a particular book is the same as the book in the same location on a stein for a different profession. The conformity is probably due to the book stein bodies being mass produced as blank body forms (“body blanks”) so that they could be used for any of the professions. However, some of the steins bear additional white glaze on a section of a book. This glaze appears to have been applied randomly in the finishing process. Ten of the books on each stein bear impressed decorations, which have been gilded in the decorating process, similar to those found on the leather spines of old books. The incised decorations on the book spines is the same on steins for different professions with the exception of one book on the doctor and the miner. On these two steins the decoration on the top section of the fourth book from the handle in a clockwise rotation has been eliminated to permit an additional panel to be used for book identification. Fig. 2 – Three different thumblifts and a pewter variation on the right stein. 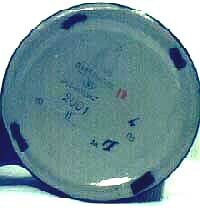 The titles and authors appear to be applied by a Print Under Glaze (“P.U.G.”) method on the body blanks. The glaze that is applied on each title and author section is colored. The color glaze applied on corresponding books for different professions is normally the same except for shading. However, the upper glazed band on the first two books from the handle in a clockwise rotation are either red or yellow mottled with red. Sometimes during the decorating process the titles or authors were applied to the body blanks upside down, or the words in the title were applied in the wrong order, on the spine of a book. (See Figure 1.) In addition, although the books identified on steins for the same profession appear to be the same, they were often applied in different orders during the decorating process. The spines of the books on most steins have been coated with a clear, shiny glaze. Variations exist where no glaze has been applied, leaving the books with a dull finish. The interior of each stein is coated with the typical Mettlach white porcelain-like shiny glaze. The upper part of the handle is attached at the top of the spines of the books, or above them. The lower part of the handle is usually attached at the bottom of the spines, although at least one variation exists where the lower part of the handle is attached to the lower base band. Fig. 3 – Base attachment differences. Higher attachment on right stein. The lid rim around the inlay is usually in 3 sections. The portion closest to the inlay is usually slanted, the middle portion convex and the lower portion concave. A variation exists where the lower concave portion is the width of the 2 lower sections on the usual lid rim. This section on the variation is topped with a ridge with dots, giving it a milled appearance. The upper part of the lid rim on the variation begins as concave and changes to convex. The tang between the lid and thumblift on the lid rim variation is longer and thinner, as is the pewter strap support, running down the handle from the strap. (See Figure 3.) A second variation has a double-decker pewter lid rim which has the appearance of two pewter lid rims stacked on top of each other. 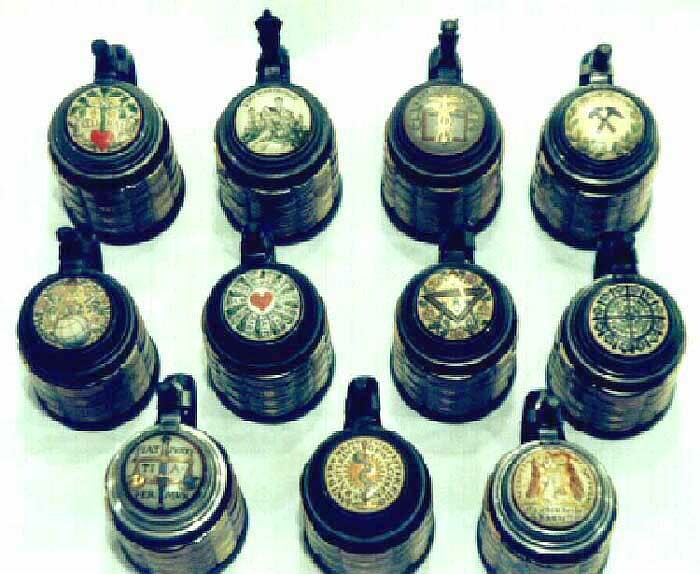 Although each of the profession steins was available with a pewter lid, there was a distinct slightly domed etched inlay for each profession. (See Figure 4.) The different inlays for each of the profession steins will be covered below. The background color for each inlay is usually white. (Figure 5) However, a grey background variation exists, based upon our experience, for the lawyer, doctor and merchant steins. (Figure 6) At the outer circumference of each of the profession stein inlays are two thin concentric circles. The outer circle is usually glazed the same blue as the upper and lower bands on the body although some are white. The second circle is a dark red or maroon. The outer circle may be partially or completely covered by the pewter rim. Fig. 4 – Book stein inlays. Left to right. Top row: Forester; Theologian; Merchant; Miner. Middle Row: Mathmatician; Natural Science; Architect; Engineer. Bottom Row: Lawyer; Medical Man; Philogist. The base of each book stein bears the usual incised Mettlach markings including the castle mark, size number, quality control number, form number 2001 and year of manufacture. (Figure 7) The gold and black painter’s marks and mercury mark are applied. A black capital letter is applied to the base in the same way the decoration number is applied on a P.U.G. stein. As with a P.U.G. stein, the letter on the bottom of a form #2001 stein identifies the decoration, i.e., the books, on the stein. The letter also identifies the associated etched inlaid lid. As seen in the chart, the lettering goes from A through I, together with K and L, for the eleven professions. The letter C is used even though it is not a letter which is commonly used by itself in the German language. The letter J is not used. A clear glaze is applied over the base of the steins. One or more of the markings may be missing. A twelfth stein, for Cornell University, was also made by Mettlach which falls within this series. The Cornell stein uses the same body and pewter as the profession steins, but has different band colors and a non-incised flat (not domed) inlaid P.U.G. lid dedicated to Ezra Cornell, the namesake and one of the founders of Cornell University. (Figure 8) This stein has not been specifically credited to Otto Hupp to our knowledge, although it seems likely that he was the designer because the form of the stein (except the inlay) is the same as the profession steins and, as Dr. Thomas notes, he likely designed another stein for Cornell University, the 1-liter form #2871. There is no mention of the Cornell book stein in the Mettlach catalogues. It appears to have been a special order but was probably not ordered by Rothschild Bros., as form #s 2871 and 2872 were, because there is no green stamp applied to the base of form #2001 R stating “Made Exclusively for Rothschild Bros., Ithaca, N.Y., U.S.A., Designed by W. M. Miller ... J.F.L. Ackerman” as there is on the bases of the other two form numbers. Based upon the limited availability, as attested by auction results, it apparently was a much smaller special order than the other two etched Cornell University steins. As discussed below, the decoration of each Cornell book stein was apparently adapted to the course of study of the stein recipient or purchaser because several variations of the Cornell book stein exist. 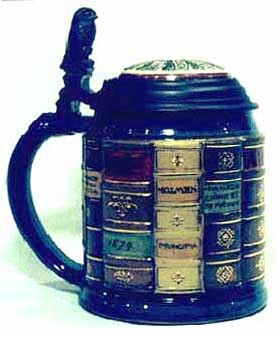 An almost entirely different set of books are depicted on each variation of this stein. However, they all appear to have been made from book stein body blanks manufactured in 1897. Fig. 5 – White background insert. Fig. 6 – Grey background insert. The titles of the eleven books depicted on the stein body are predominately Latin. They are: Lib. Pand. volumes 1 and 2; Corpus Institutionum Justiniani by Diling dated 1574; Peinl. Ger. Ordnung (German Penal Regulations) by K. Karoli dated 1532; De Pace Publica, dated 1586; Corpus Juris Civilis: Practica Lanfranci, dated 1528; C. J. C. by Gotofred from Geneva dated 1624; Volumen Legum Parvum by Venetiis, dated 1597; Practice Juris and Viatoriu Utriusque Juris. These books detail the civil and penal statutes which prescribe the code of conduct on which justice is based, the principles of law and the means that are used in the administration of the law. The books on the steins, which are medical text books, are two volumes of Deutsche Chirurgie (German Surgery) by Billroth & Lücke; Archiv für Klinisch Chirurgie (Archive for Clinical Surgery), dated 1860; Aetiologie Der Tuberculose (Etiology of Tuberculosis) by Koch; Kleinere Schriften by Virchow; Reichs-Gesund: Heits-Amt (German Department of Public Health) by A. D. Mittheil ; Anaesthetica (Anesthesia) by Nepom Nussbaum; Schadellehre (Phrenology) by Franz Jos. Gall; De Corporis Humani Fabrica by And. Vesal., dated 1543; Opera (Operations) by Galeni; and Reine Arzneimittel Lehre (Pure Pharmacology) by Hahnemann. Interestingly, Heinrich Hermann Koch (1843-1910) was the discoverer of the germ causing tuberculosis (the subject of his book). Rudolph Ludwig Virchow (1821-1903) was the founder of cellular biology. Franz Joseph Gall (1758-1838) was the founder of phrenology which claims that an individual’s character and mental abilities are reflected in, and can be determined from, the precise shape of the skull because this reveals the size of the underlying cerebrum (part of the brain). The size is then compared to the “normal” size of the brain to determine the powers of that person’s mental processes. Albert Billroth (1829-1894) performed the first successful resection of the esophagus and stomach. Samuel Hahnemann (1755-1843) was a leader in Homeopathic medicine. Galen (131-200 A.D.) was the founder of experimental physiology and anatomy and Andreas Vesallus (1514-1564) was the founder of modern anatomy. The inlay depicts 2 owls; one serious and the other wearing a fool’s cap with bells, holding a fool’s staff in his talon similar to a court jester. The fool, utterly spontaneous and natural, lacks experience but also any trace of affectation. The serious owl represents wisdom attained which has affected his approach to life. At the top of the inlay are the latin words “Scientia” and “Lascivia” (“knowledge” and “playfulness”) and at the bottom are the words “Es Leben beide Kauze!! !” (Both should exist in life). Fig. 7 – Base markings. A philologist is a scholar who is involved in the study of ancient language and literature. Most are employed as professors by universities. They are learned writers, philosophers and historians that translate and extensively annotate the ancient texts of Greece and Rome. The books depicted are two volumes of Hugo Grotius dated Paris 1625; Aldus Manutius Diction Graecum, 1497 by the Beigebünd: Institution Graeco-Lat. ; Guil Bude de Philologia, dated 1533; Sonrad Seltes; Petrarca de Vera Sapientia, dated 1485; Prolegomeno in Homerum by Fr. A. Wolf, dated 1795; Die Kunsl der Lebersetzüng by Johs. Tycho Mommsch; Römisches Staatsrecht (Roman Public Laws) by Th. Mommsen, I and II Band; Puscula Philologic by R. Bentley, dated 1781; and Aüg. Böckh de metris by Pindari. Richard Bentley (1662-1742) was an English critic and classical scholar who was appointed Master of Trinity College at Cambridge in 1700. Theodore Mommsen (1817-1903), a German historian, was a professor of Roman law at Liepzig University. He was a critic of Bismarck’s domestic policy and a Nobel Prize winner in literature (1902). His Römisches Steatsrecht, shown on the stein, were published 1871-1876. This inlay depicts a drafting compass measuring or marking the diameter of a sphere. 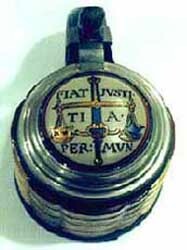 The drafting compass is a symbol for geometry and planning. The sphere is the basic geometric form. The sphere on the inlay bears longitudinal and latitudinal lines. Pink flowers on a vine provide the background for the design. The inlay bears no incised wording. The books depicted on the stein are volumes 1 and 2 Leibniz Briefe (Papers of Leibniz) by Theil; Opere di Galilei, dated 1655; Arithmetica Universal by Newton; Pÿtagoreorum Reliquiis, dated 1844 by Beckman; K. F. Gauss Gesammtausgabe (Complete Works of K. F. Gauss), dated 1863-74; Astronomia by Kepler; Lehrbuch d. Statik (Textbook of Statics) (branch of mechanics that deals with bodies at rest and forces in equilibrium) by Aug. Ferd. Möbius; Oeuvres Complet by Laplace from Paris, dated 1843-48; Archimedes; and Kopernicus de Revolutionibus orb. Coelestium. Isaac Newton (1642-1727) was a famed English mathematician and astronomer (who “discovered” gravity). Pythagoras of Samos (560-480 B.C.) and Archimedes (287-212 B.C.) were Greek mathematicians famous for the Pythagorean Theorum and methods for computing areas and volumes, respectively. Karl Friedrich Gauss (1777-1855), a German mathematician, was responsible for the first study of quadratic differential forms in two variables. Johannes Kepler (1571-1630) was a German astronomer who established that the planets move in elliptical orbits. Nicolaus Copernicus (1473-1543), a Polish astronomer, established that the earth revolves yearly around the center of the universe. Augustus Ferdinand Möbius (1790-1868) was a German mathematician who discovered the Mobius strip, a surface with only one side, and Pierre Simon LaPlace (1749-1827) was a French astronomer. The books on the stein are Brehm’s Thierleben by Vögel; Brehm’s Thierleben by Sängethiere; Darwin Gesammtausgabe (Complete Edition of Darwin) dated 1872 by Deutsch u Carvs; Annalend Chemie (Annals of Chemistry) by Liebig; Handwörterbuch der Chemie (Pocket Dictionary of Chemistry) by Liebig; Aristoteles; Annales de Chimie et de Physique (Annals of Chemistry and Physics); Newton Principia; Geschichte der Physik (History of Physics) by Poggendorff dated 1879; Physikal Lexicon (Encyclopedia of Physics) by Marbach; and Urbevölkerung Europ by Virchow. The individuals that are the subjects of these books, and some of the authors, were renowned astronomers, biologists, chemists, physicists and health scientists. Hermann Carl Vögel (1841-1907) was a German astronomer and Rudolph Virchow (1821-1902) a German pathologist. Charles Robert Darwin (1809-1883) was an English biologist famous for the theory of evolution. Justus von Liebig (1803-73) was a German chemist and Aristotle (384-322 B.C.) was a Greek whose laws of physics served as a basis for future physicists. The inlay depicts a drafting compass, triangle and plumb bob (or plummet) surrounded by red-tinged flowers on vines. The T-square and compass are used in drawing, while the plumb bob is used to ensure that a wall is perpendicular. 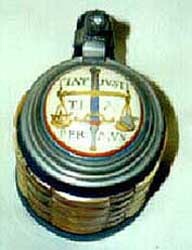 It is interesting to note that these items are also symbols used by the Masons to teach basic moral truths. There is no incised wording on the inlay. The books shown are der Stil (The Style) by Semper first and second editions; Dictionnaire de L’Architecture Francaise (Encyclopedia of French Architecture) by Viollet Le Duc from Paris, dated 1854-69; Gründriss d. Künstgeschichte (History of Design) by Lübke; Geschichte d. deutsch Renaiss. Architekt. (History of German Renaissance Architecture) by Lubke; De Architectura by Vitruvius; Geschicht der Bild: Kunst (Illustrated History of Architecture) by Schnaase; Architektur Deutschlands (German Architecture) by Licht dated 1880; History of Architecture by Fergusson, dated 1865/1870; Owen Jones and Geschichte der Baukunst (History of Structural Engineering) by Kugler. The authors of some of these books were famous architects. Viollet-Le-Duc was one of a group of brilliant architects that worked in Paris in the 1840s as part of the Neo-Grec movement. His works were extensively published even though most of his ideas did not become widely accepted for half-a-century. He was so far ahead of his times that after he was appointed head of the Architecture Department at Ecole des Beaux Arts, the students struck, resulting in the withdrawal of his appointment. Licht was the architect of Liepzig City Hall, an example of Eclectic German Renaissance Architecture. Gottfried Semper was the architect of the Theatre and Opera House in Dresden, an example of Eclectic Classic Architecture. Marcus Vitruvius Pollio was a famous architect of the Roman Empire during the reign of Augustus approximately 2000 years ago. Ten of his books still exist and his chapters on the education of architects and the architects’ professional duties and the responsibilities are still widely applicable today. The Owen Jones book may be a book about two English architects, Robert Owen and Inigo Jones. Owen was a leader of the early 19th Century movement for design of Utopian communities and Jones was a leader of the Baroque style of architecture in the early 17th Century. Jones was the architect of The Banqueting Hall, Whitehall in London. The inlay for letter G is a cog wheel or gear. The gear is interwoven with blue flowers emanating from the center of the gear. No wording is depicted on this, the simplest of the book stein inlays. The books depicted on the stein are Life of George Stephenson by Sam Smiles, dated 1881; Life of Robert Stephenson by Jeaffreson & Pole dated 1864; sours de Construction by Minard, dated Paris 1816; Technisches Wörterbuch (Technical Dictionary) by Karmarsch; Life of James Watt: Handbuch der Ingenieurwissenschaft (Handbook of Engineering Knowledge); Kleinere Schriften by Engerth; Technolog Jahresberichte (Technological Annual Report) by Rudolf von Wagner; Polytechnisches Journal (Technical Journal) by Zeman & Fischer; Deutsche Industrie (German Industry); and Waffenbau (Making Weapons) by Hagen. George Stevenson (1781-1848) is known as the inventor of the steam locomotive. His son Robert (1803-1859) was famous for railroad and bridge building. James Watt (1736-1819) so advanced the design of the steam engine that he is one of three engineers credited with inventing it. The inlay of this stein depicts a live oak, with four acorns, with its trunk and roots growing out of a heart. Oak trees are the symbol of immortality or endurance. Because they were thought of as being frequently struck by lightning, they were associated with the God of Lightning and the Heavens, Jupiter or Zeus. To German romantic poets, the oak tree symbolizes loyalty and unshakable power. Oak groves were places of worship in Germanic rites. Acorns symbolize male sexuality and fertility, as well as life and immortality. The heart at the base of the trunk represents that the tree is essential for maintaining life. A banner on the inlay carries the incised words “HALLI HALLO.” This translates to Hello (my friend), Hello. Foresters are experts in the science of forestry who are state employed. They supervise and maintain the forest. They received six to seven years of college education and took Latin and Greek in addition to Biology. At the time that these steins were designed, foresters were held in high regard and were among a town’s upper class (which included the Priest, doctor, pharmacist, teacher, mayor and forester) because of the important position they held and their extensive education. They were responsible for managing the forest’s flora and fauna and determined how many trees could be cut and how many animals could be hunted. The books on the stein deal with the duties of the forester. The books are two volumes of Jagdwissenschaft (The Science of Hunting) by Bechstein; Forstzoologie (Forest Animals) by Altum, dated 1876-1881; Waldpflege (Forest Cultivation) by König; Der Forstschütz (Forest Hunting) by Hess, dated 1878; Forstliches Hilfsbuch (Textbook of Forestry) by M. R. Pressler; Ridingel Betrachtung der Wilden by Thiere; Tschüdi Handbüch by Leipzig, dated 1878; Jagden (Hunting) by K. F. H. Frei v. Munchhausen; Jäger Brevier (Hunter’s Prayer Book); and Deutsche Jagd Zeitung (German Hunting Seasons). The inlay depicts the Wartburg castle. At the top of the inlay is a banner with the incised wording “Die Wartburg.” Variations exist in the inlays due to the glaze that is applied for the trees, roadway and castle roof. The Wartburg castle, begun in 1067, sits atop one of the foot hills of the Thuringian Forest overlooking the town of Eisenach (the birthplace of Johann Sebastian Bach in 1685) in what was East Germany. The castle hosted the famous German minstrels Walter van der Vogelweide and Wolfram von Eschenbach, as well as Richard Wagner and Goethe. According to legend, van der Vogelweide won the contest of the Minnesingers (a song contest) here which is immortalized in Wagner’s Tannhäuser. Martin Luther sought shelter here from papal proscription from May, 1521 to March, 1522. During this time, he translated the New Testament from Greek into German, an act which paved the way for the Protestant Reformation. It is Luther’s activities here that resulted in the Wartburg castle being a symbol of evangelical theology and, as a result, the inlay for this stein. The books depicted on the stein are Summa Theologiae by Thomas Aquinas; Luthers Saemmtliche Werke by Walch; Kirchen v. Ketzer Historie (Church v. Heretic History) by Unparth. Arnold, dated 1699; Dogmengeschichte (History of Dogma) by Harnack; Epistolae Obscurorum Virorum; Alexandrinus Paidagogos (Alexandria Tutor; the latter word being in Greek, not Latin, letters on the stein but transliterated for ease of publication) by Clemens; System I by Frank; Theol. Stud u Kritiken (Theologic Students and Critics), dated 1818; Predicten Ueber Den Christlichen Hausstand by Schleiermacher; Geistl. Lieder (Psalms) by Luther; and Relemik by Hase. Fig. 8 – Cornell stein inlay. The evangelical or christian theologian attempts to spread the christian message (Holy Scripture). The theologian is a servant of God’s word and must translate it for the masses. Thomas Aquinas, born in 1224, started the Summa Theologiae in 1266 but stopped in 1273 before it was completed. He is responsible for the five proofs that God exists and he distinguished between natural theology (man’s philosophic study of religious questions) and revealed theology (God giving a special relevation of himself). Martin Luther, credited with starting the Reformation, believed that no man needed a priest to mediate between himself and God because Christ was the perfect mediator. He translated the Bible and believed that it was entirely true. Adolph von Harnack’s writings reduced Christianity to three affirmations: (1) God the Father, his providence and goodness; (2) the divine sonship of man; and (3) the infinite value of the soul. He denied the miracles of Jesus and insisted Jesus did not claim to be the Messiah or divine. He urged the masses to get back to the religion of Jesus not the religion about Jesus. His book which is depicted on the stein is about the end of Christian Dogma. F.H.R. Frank (1827-1894) was a professor in Erlangen who produced a whole system of theology titled System I. Under that system, the belief is that because I am here now as a Christian, all of the biblical stories are guaranteed. Friedrich Schleiermacher (1768-1834) urged that the heart of religion was feeling, not rational proofs and discussions about the Bible. According to Schleiermacher, religion was separate from philosophy and science. Lastly, Alexandria was the site of a theological seminary which stressed a scientific methodological explanation of Christian faith. The books shown are Bankgeschäft (The Business of Banking) by O. Swoboda; Handelskorrespond (Commercial Writing) by A. Schiebe; Quintessenz des Kaufmännischen Rechnens (Quintessence of Commercial Calculations) by Dr. E. Amthor; Buchführuncnach Deutschem Gesetze (Bookkeeping in Conformity with German Law) by R. Beigel; Praxis Des Lebens Geschäfts (Practice of Existing Business) by Th. Piening; Taschenbuch Für Kaufleute (Notebook for Merchants) by Rothschild; Kaufmännische Rechtskunde (Commercial Legal Documents) by R. J. Fischer; Wechsung der deutsche Zolltarif (Changes in German Tariffs); Handelsgesetzbuch und Wechselordnung (Commercial Code and Law Regarding Bills of Exchange) by Basch; Warenlexikon (Commodity Encyclopedia) by C. Merck; and Geograph. statist. Lexicon by Ritter. The inlay bears a hammer and a pick with crossed handles (the symbol of mining). At the top of the inlay is the legend “Glück Auf!” which translates to “Good Luck!” The hammer head has two square faces and the pick has one square face and one pointed face for cleaning away dirt or exploring a crack or vein. The heads on the hammer and the pick are heavier than a carpenter’s hammer allowing for much more force to be generated to assist in breaking apart rock. Two crossed branches of oak leaves are at the bottom of the inlay. Symbolically, a wreath of oak leaves adorned those who were victorious or had saved the lives of others. During the middle ages, German miners were considered the greatest in the world and their services were sought by kings and mine owners throughout Europe. However, the work conditions remained poor for miners throughout the Industrial Revolution. The books on the stein are more geared to mine owners or operators than the miners themselves, because subjects like Orology and Mining Law would be far above the education level of anyone but the nobility who owned and ran the mines. The books shown are: Berggesetz (Mining Law) by Dr. Jur H. Brassert (2 volumes); Katechismus der Bergbaukunde (Catechism of Mining Orology) by Stöhr; Bergpostille oder Sarepta (Mountain Prayers Over Sarepta) by M. J. Mathesius dated 1578; Der Bergmanns freund (The Miner’s Friend); Zeitschrift für das Berg (The Mountain Journal) by Hütten und Salinenwesen; Archiv für Bergbau (Archive for Mining) by Karsten, dated 1818; Bergreihenbuch (Mountain Range Book) by C. Ch. W. Kolbe, dated 1802; Die Hulzbaren Mineralien im deutschen Reiche by Dr. H. v. Dechen; Bergbaukunde by Köhler; and Bergbaukunde (Mining Orology) by Lottnerserlo. Fig. 9 – Lawyer book stein on the right, Cornell book stein on the left. The inlay is a gold P.U.G. portrait of Ezra Cornell, the namesake, and one of the founders, of Cornell University, on a glazed white inlay. Around his portrait are two concentric gold P.U.G. rings. The outer one reads “The Cornell University: Founded A.D. 1865”. The inner one has the name “Ezra Cornell” over the portrait and the words “I would found an institution where any person can find instruction in any study” around the rest of the ring. Cornell University was incorporated in 1865 and opened in 1868. It was founded by a $500,000 contribution by Ezra Cornell, who also assisted in securing New York’s land grant share, under the Morril Act of 1862, for the university. The money donated by Ezra Cornell came from his immense holdings as one of the founders of Western Union Telegraph. In addition to the two different sets of books on the Cornell book stein articulated in the June, 1975 Prosit article by J. Joseph Hersch, M.D. and Arthur B. Commings and the column by Mario Pancino in the December, 1976 issue of Prosit, there is at least one other variation of the books on this stein. On the third variation the books are “Ethics” by C. M. Tyler; Contracts by E. W. Huffcut; Introduction to Shakespeare by Hiram Gorson; Blue and the Gray by F. M. Finch; Warfare of Science by A. D. White; Belief in God by J. G. Schurman; American Literature by M. C. Tyler; Greek and Comparative Philology by B. J. Wheeler; Deutsche Volksheden by H. S. White; Herman and Dorothea by W. T. Hewett; and Latin Prose Composite by C. P. Bennett. This stein suggests the recipient or purchaser pursued a liberal arts course of study whereas the books on the steins described in the other two articles suggest courses of study in engineering and science respectively. The only book which is the same on all three steins is Belief in God by J.G. Schurman. This may have been a required course or reading for a degree at Cornell University regardless of the course of study. It is interesting to note that one of the textbooks used at Cornell which is depicted on the stein is A History of the Warfare of Science with Theology in Christendom (1896). This book was written by Andrew Dickson White (1832-1918) who, with Ezra Cornell, founded Cornell University. He taught history there and was its first president before becoming a United States Minister to both Germany and Russia, as well as Ambassador to Germany and president of the International Peace Conference at The Hague in 1899. J.G. Schurman was the second president of Cornell University. Often we find stein collectors looking at these book steins in a collection, auction preview or stein sale table saying “Oh, it’s only a book stein,” as if it does not have the artistry or intrinsic value of, or require as much planning in design as, an etched Mettlach stein. As can be seen, these steins required a great deal of planning in the design stage so that they would accurately depict books that were in use at the time which were by or about the leading men in the particular field. The artistry and symbolism associated with the inlaid lids on these steins is impressive. The relative rarity of most of these steins in comparison to other Mettlach steins probably indicates that most of the set was not popular or that the number of persons in that profession was limited. The relative rarity of most of the set, and the large number of steins that are required to complete the set, have resulted in this series being a very difficult one for today’s collector to complete. Ammelounx, Hans J.,,Mettlacher Steinzeug 1885-1905, Wheeling, Illinois,1975. Biederman, Hans, Dictionary of Symbolism, Facts on File, New York, 1992. Collier’s Encyclopedia, P.F. Collier, New York,1994. Cooper, J.C., An Illustrated Encyclopedia of Traditional Symbols, Thames and Hudson, London, 1978. Fodor’s 94; Germany, Fodor’s Travel Publications, Inc., New York, 1993. Franck, Irene M. and David M. Brownstone, Manufacturers and Miners, Facts On File, New York, 1989. Hamlin, Talbot, Architecture Through the Ages, G.P. Putnam’s Sons, New York, 1953. Hersh, J. Joseph, M.D., and Arthur B. Cummings, “The Cornell University Steins by Mettlach,” Prosit, Vol. 40, p. 274, June, 1975. Hordern, William, A Layman’s Guide to Protestant Theology, The MacMillan Company, New York, 1961. Josphe, Glen, M.D., “Doctor Book Stein,” Prosit, Vol. 69, p. 934, September, 1982. Kirby, Richard Shelton, Sidney Withington, Arthur Burr Darling and Frederick Gridley Kilgour, Engineering in History, McGraw-Hill Book Company, Inc., New York, 1956. Kirsner, Gary, The Mettlach Book, Glentiques, Ltd. Inc., Coral Springs, Florida, 1987. Küng, Hans, Great Christian Thinkers, The Continuum Publishing Company, New York, 1994. Pancino, Mario, “Here’s One For the Book Stein Lovers,” Prosit, Vol. 46, p. 374, December.1976. Parkinson, Claire L., Breakthroughs, G.K. Hall & Co., Boston, 1985. Thomas, Therese, “The Artistic Contribution of Otto Hupp to the Manufacture of Stoneware in Mettlach,” Prosit, Vol. 2, No.11, p. 353, September, 1994. Tillien, Paul, A History of Christian Thought, Simon & Schuster, New York, 1968.